"Laser" redirects here. For Fox and Falco's neutral special move, see Blaster. Robo Beam used on Mega Man in Ultimate. Robo Beam (ロボビーム, Robo Beam) is R.O.B. 's neutral special move. The attack is a thin, crimson laser that does a small amount of damage (normally 5%) and has decent hitstun. It can be angled up or down and ricochets off of walls and floors, though it will stop if it hits a wall head-on. The laser will penetrate any targets it hits for its lifetime. R.O.B. must wait 1 second for the laser to recharge, or else he will shoot a short-ranged burst that can only hit opponents at point-blank range. Despite its significantly shorter range, the uncharged version deals more damage than the standard Robo Beam. When the laser is charged, the red light on R.O.B. 's head will begin to flash. Kirby also has this property when he copies R.O.B. There are actually two levels of charge: the aforementioned standard "charge", and the Super Robo Beam, which charges if the beam is left alone for 20 seconds. Super Robo Beam is much stronger and thicker and has increased range (enough to travel all the way across any stage), though it is significantly slower than a normal Robo Beam. If used at a very close range, the beam will do stronger flame damage, starting at 9%. In The Subspace Emissary, R.O.B. Blasters use a purple Robo Beam, although it is shorter and cannot be charged. "Fire a laser beam, but only when the LED on your head is flashing. It can bounce off the floor." "A Robo Beam that can be fired at a wider range of angles but doesn't do quite as much damage." "Never runs out of charge, but isn't as strong as the standard Robo Beam." Wide-Angle Beam: R.O.B. can aim on a much wider arc, but it has slightly longer start-up and deals less damage. Infinite Robo Beam: Robo Beam can be fired consecutively, but it takes longer to charge to Super Robo Beam. It also deals less damage, has slightly longer start-up and both beams lose their ability to ricochet. Wide-Angle Beam in Super Smash Bros. for Nintendo 3DS. Wide-Angle Beam at its full charge. Infinite Robo Beam in Super Smash Bros. for Nintendo 3DS. Infinite Robo Beam at its full charge. 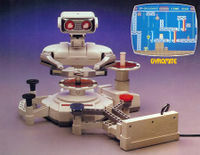 An advertisement snippet showing R.O.B. 's glowing eyes. Robo Beam is virtually identical in function (including the ricochet) to the Laser copy ability from the Kirby series. R.O.B. has no relation to the Kirby franchise (outside of a guest appearance in Kirby's Dream Land 3), but this move is likely to have been an idea incorporated by Kirby creator and Super Smash Bros. director Masahiro Sakurai when putting together R.O.B. 's moveset. While the real life R.O.B. toy obviously never had the ability to fire lasers, the flashing red LED on R.O.B. 's head being an indicator of Robo Beam's charge is a throwback to when the red light flashed to indicate that R.O.B. was ready for use with the NES. Uncharged Robo Beam in Brawl. Robo Beam angled downward by tilting down while shooting in Brawl. Super Robo Beam, angled upward by tilting up while shooting in Brawl. Super Robo Beam in Super Smash Bros. for Nintendo 3DS. Robo Beam in Super Smash Bros. for Nintendo 3DS. Super Robo Beam in Super Smash Bros. for Wii U.
Robo Beam as shown with NES colors by a Skill Preview in Ultimate. Robo Beam as shown with Famicom colors by a Skill Preview in Ultimate. When the beam is uncharged, R.O.B. 's arms will be down instead of facing straight forward. This page was last edited on March 10, 2019, at 18:44.